Professional USB audio microphones for connecting to your PC or Mac. For more delivery and purchase details see the "Buy Now" page. 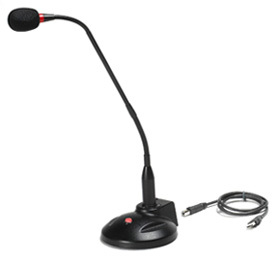 Professional 18 inch gooseneck uni-directional, noise cancelling, microphone with 10 ft. cord and a plug and play USB connector. Windows 2000/XP/Vista/7/8 or Mac OS X.
Transform your PC or Mac into a state-of-the-art production studio with the MXL Studio 24. 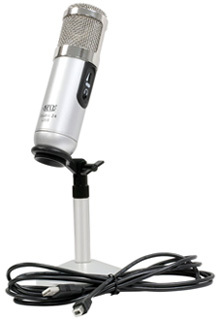 This HD-quality USB microphone shines on instruments, vocals or any audio source. Most importantly, it captures every detail of your work with 24-bit audio quality. The Studio 24 is the perfect tool for traveling musicians and podcasters. It incorporates a 22mm condenser capsule, which is the same capsule found in high-end studio microphones. 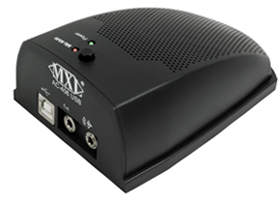 The MXL AC-406 is a USB boundary microphone and speaker designed specifically for web conferencing. It offers clear sound and 180-degree coverage. Multiple people can participate in the conversation without the need for additional mics. In addition to web conferencing, the AC-406 works exceptionally well with speech-to-text software and it has a mute button for private conversations. Bulky computer speakers can be replaced with the AC-406 to play music and pick up internet calls - all with the same device.